James S. A. Corey is the pen name used by collaborators Daniel Abraham and Ty Franck, authors of the science fiction series The Expanse. The first and last name are taken from Abraham's and Franck's middle names, respectively, and S. A. are the initials of Abraham's daughter. The name is also meant to emulate many of the space opera writers of the 1970s. In Germany, their books are published under the name James Corey with the middle initials omitted. 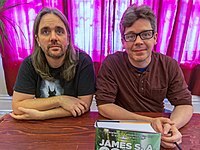 Under the pen name James S. A. Corey, fantasy author Daniel Abraham began to collaborate with personal assistant to George R. R. Martin Ty Franck in 2011. Together they wrote Leviathan Wakes (2011), the first science fiction novel in the series The Expanse. Leviathan Wakes was nominated for the 2012 Hugo Award for Best Novel and the 2012 Locus Award for Best Science Fiction Novel. The authors began to release other novels in the series including Caliban's War (2012), Abaddon's Gate (2013), Cibola Burn (2014), Nemesis Games (2015), Babylon's Ashes (2016), and Persepolis Rising (2017). Abaddon's Gate won the Locus Award. Orbit Books signed the authors to write additional books in the Expanse series to bring the total to nine. The eighth and latest book in the series, Tiamat's Wrath, was released on March 26, 2019. As other authors in recent years have done, between each pair of full-length books they published shorter works in the series. The first, a short story entitled "The Butcher of Anderson Station: A Story of The Expanse" was released as an eBook in October 2011. A 69-page novella, Gods of Risk followed, and was released as an eBook on September 2012. A short story entitled "Drive" was released in November 2012 as a part of the anthology Edge of Infinity. Another novella, The Churn, was released April 29, 2014. All are set in The Expanse series. The authors have also written a Star Wars novel, Honor Among Thieves, published by Random House in 2014, and a short story unrelated to The Expanse titled "A Man Without Honor", included in the anthology Old Mars, edited by George R. R. Martin. ^ "Evolution of a Space Epic: James S.A. Corey's The Expanse". May 27, 2015. ^ "Amazon.de - Leviathan erwacht". ^ "sfadb: Hugo Awards 2012". sfadb.com. Retrieved September 5, 2015. ^ "sfadb: Locus Awards 2012". sfadb.com. Retrieved September 5, 2015. ^ "James SA Corey - Abaddon's Gate cover art launch, synopsis and release date revealed". Archived from the original on October 26, 2012. ^ "sfadb: Locus Awards 2014". sfadb.com. Retrieved September 5, 2015. ^ "CIBOLA BURN is available now and a big announcement!". ^ "Amazon.com: Tiamat's Wrath (The Expanse) (9780316332873): James S. A. Corey: Books". ^ "New Expanse Novella by James S.A. Corey, Gods of Risk to be published on 15th September". Archived from the original on September 10, 2012. ^ "Goodreads.com - Edge of Infinity". ^ ""The Churn": An Expanse Novella by James S.A. Corey, by Carl V. Anderson". May 2, 2014. Retrieved May 2, 2014. ^ "Georgerrmartin.com - Old Mars". This page was last edited on 28 March 2019, at 06:49 (UTC).